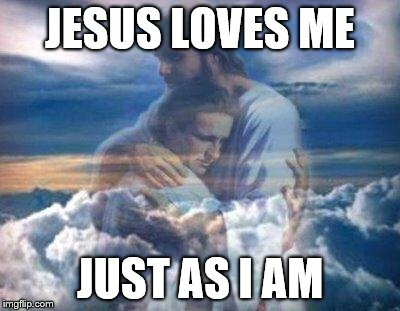 Jesus Loves Me–Just As I Am! I grew up in a Southern Baptist church where this was probably the most-sung hymn. Rarely did a Sunday go by that we didn’t sing at least one verse of this old hymn. I won’t go through all the lyrics but the point of the song is that God loves me just as I am. I don’t have to do anything for God to love me. He loves me just as I am. That is an amazing thing! God did not create us to be like anyone else. He created each of us to be our own unique self and he loves us with all our faults, our insecurities, and our not-so-perfect selves. God sees us in a way we don’t (or can’t) see ourselves. When we compare ourselves to others, especially to people we love and admire, we begin to believe we aren’t good enough. And if we’re not good enough, then God must not love us as much as he loves other people. But God loves me just as I am. It can be hard to remember that when we’re struggling with life’s issues. So here’s a few of my favorite verses about God’s love for me–and for you. Imagine that–God rejoicing over little old me! Job 34:19: … who shows no partiality to princes, nor regards the rich more than the poor, for they are all the work of his hands? God loves me because he created me and that means I’m good enough just the way I am because God doesn’t make mistakes! Abounding in love and faithfulness! We don’t have to do anything to have God love us. We don’t have to work for God’s love. We don’t have to be perfect because, of course, we can’t be. All we have to do is accept God’s love.